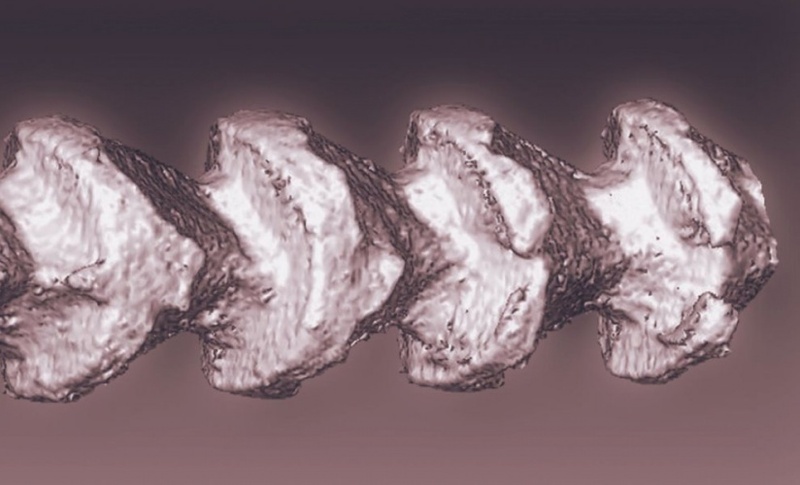 Researchers from the University of Chicago have developed an artificial skeleton-like material that could make it easier to integrate medical devices into the body. According to the team, the synthetic silicon-based spicules – described as mesoscopic three-dimensional semiconductors – show huge potential for improving the interaction between soft biological tissue and a host of implantable medical devices. The 3-D silicon mesostructure is designed for integration with biological systems. The method for producing these devices – which is described in Science – is underpinned by a number of key advances. One was the demonstration of a chemical lithography process able to produce 3D structures. Existing lithographic techniques create features over flat surfaces. This was made possible by a pressure modulation technique designed to promote the growth of silicon nanowires and to induce gold-based patterns in the silicon. Gold acts as silicon’s growth catalyst. By repeatedly increasing and decreasing the pressure on their samples, the researchers were able to control the gold’s precipitation and diffusion along the silicon’s faceted surfaces. In another advance, the team developed a novel chemical method that uses the properties of gold atoms to trap silicon-carrying electrons and selectively prevent the etching. This is very different to the wet chemical etching approach already used by the semiconductor industry where an etch-resist is used to create planar patterns on silicon wafers. The researchers, led by assistant professor in chemistry Bozhi Tian, found that even a sparse cover of gold atoms over the silicon matrix would prevent etching from occurring in their proximity. This method also applies to the 3D lithography of many other semiconductor compounds. The team tested the material by implanting it into a collagen-fibre based artificial biological tissue – and using an atomic force microscope to measure the force required to remove the spicules. According to Tian, during these tests the material displayed stronger interactions with these collagen fibres than other currently available silicon structures.